Only one species of mole is native to Oklahoma: the eastern mole. Despite having a bad rap from those who object to their mounds and tunnels, these elusive creatures are a fascinating part of Oklahoma's ecosystem. Adult eastern moles measure roughly 5 to 7 inches in length, including their tails. Their short, soft, gray-brown fur covers most of their bodies, leaving only their muzzles, feet and tails naked. They have large, shovel-shaped front feet, which are extremely useful for digging. They have no external eyes or ears. It's thought that poorly developed eyes beneath their fur and skin can detect light, but luckily they don't need to see much better than that, as they spend the majority of their lives underground. Eastern moles prefer to live in open woodland, meadows, fields and pastures. They can also be found in residential areas, especially in gardens with large lawns. These moles dig two different types of tunnel. One is a tunnel so shallow that the top of it leaves a long ridge in the earth. These shallow tunnels are used for foraging for prey. The second type of tunnel is more like a deep burrow and is the type that causes eastern moles to leave behind mole hills. It's in these tunnels that they live, nest and move from one place to another. The two main foods that eastern moles eat are insect larvae and earthworms, both of which are abundant underground. However, they'll also eat any snail, insects or invertebrates they come across while digging tunnels; they may very occasionally consume some vegetation. These moles can consume anywhere between 25 percent and 100 percent of their total body weight every day. Eastern moles have very few predators that can actually find and catch them, because they live much of their lives deep underground. However, when they're momentarily aboveground, predators such as red foxes, raccoons and black rat snakes might pose a threat. Perhaps their biggest predators are angry human gardeners, who object to having ridges and mole hills all over their lawns. 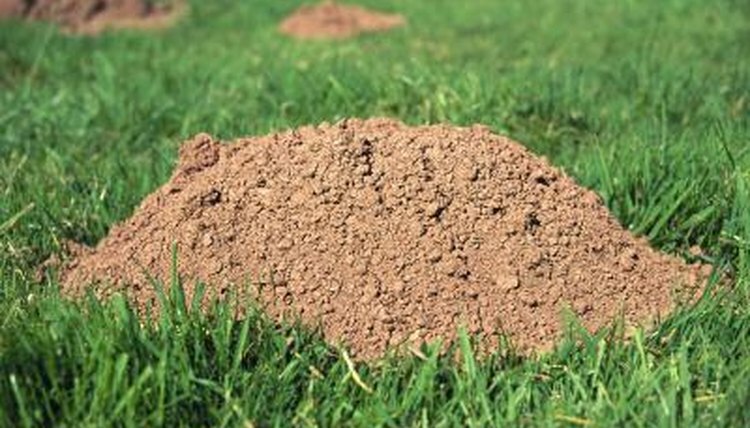 What many gardeners don't know is that eastern moles are actually very good for aerating the soil and will eat pests such as beetle larvae, which would otherwise destroy the lawn when they reach maturity. What Kind of Insects Make Tiny Holes in the Ground? What Kind of Animals Eat Moles? What Climate Can a Pill Bug Live In? What Kind of Wasps Burrow in the Ground?